← Dyeing red with dandelion… or not! Making string from scrap fabric is so simple and pleasurable (and satisfies my love of using up every last scrap so well) that I’ve found myself making more string this week. I have been thinking, since Second Skin, that it is not so much that I come from the zero waste school of sewing as that I come from the austerity school of sewing. I do draft so as to avoid creating waste, and I watched my mother dothis as a child, often starting with less fabric than her pattern called for. Then I take all the remnant fabric from previous projects and turn it into something else, even if this requires a lot of patchwork. Little of what is left beside my overlocker is wide enough to make string, even. When I tried carding ovwerlocker waste into batts a while back, most of it fell out because there was so much thread cut so short! Anyway… I’ve been turning a pair of jeans and a pair of linen pants into a bag, and although that process will use almost all the fabric in each (since I’m piecing together even relatively small sections), there are some scraps left. I cut them all to suitable widths for string making. It began with this little pile. By later in the week, I had three lengths of… well… cord? Light rope? Very shaggy string? 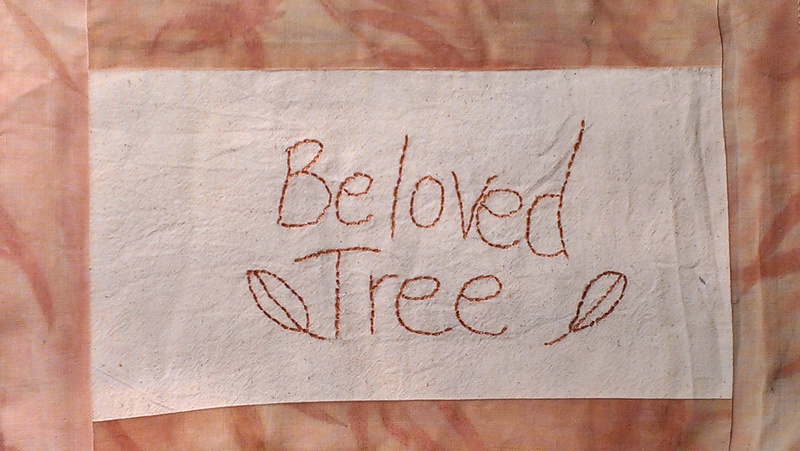 I’ve been creating small banners for trees in our local neighbourhood, and so string–cord–rope will come in handy. There’s a plan for these banners… involving other people… and brought into being by the enthusiasm of my fairy godson. I’ve made several so far from a calico sack I scored from a local business, together with recycled eco-printed fabrics and eucalyptus-dyed embroidery threads. On the inside, the interfacing is a set of damask napkins which saw their glory days long ago and have been rendered threadbare by long use. My mother-out-law sent them down to Adelaide last time my sweetheart visited her. I hope she’ll approve of this way of using them! What a great idea, both the string and the signs! How did you make the string? I’m in awe! This is a simple technique (aren’t they all? They just take a lot of practice to do well –). It is common in basketry and I learned it from a basket maker. On YouTube there are stacks of hardy blokes showing how to make ‘cordage’ as a survival skill. So funny! Anyway, same principles, just use fabric strips! You can make it from suitable plant leaves–like daylily leaves–dried and then dampened through by being rolled on a wet towel overnight. I need to do this, do you twist or plait? They look great! Thanks! It is a form of twining–you essentially perform both the step of spinning (twisting) each of two plies and then plying them together, one twist at a time. Thanks I will try it with all my threads and materials! There were people making silk string at the Melbourne workshop and it was delectable–and that was without dyeing! Thanks for the tip Wendi! 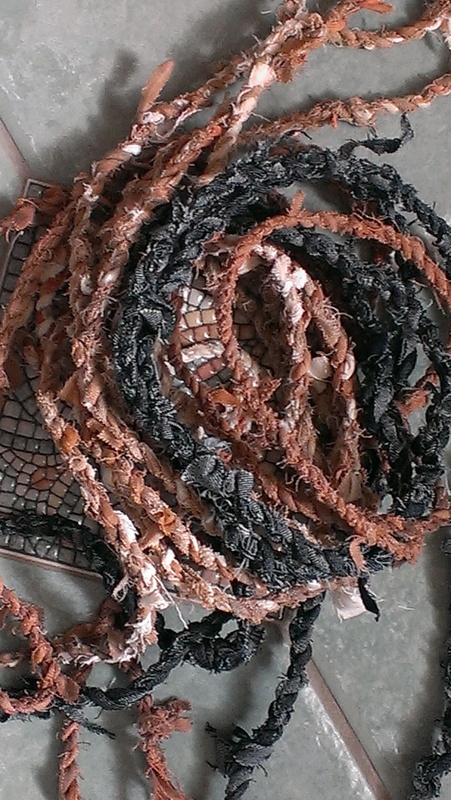 I do admire your no-waste principals – always wonder what to do with those bits left out from cutting out a pattern, and never have the patience or the time to do patchwork …. and as for making string …. 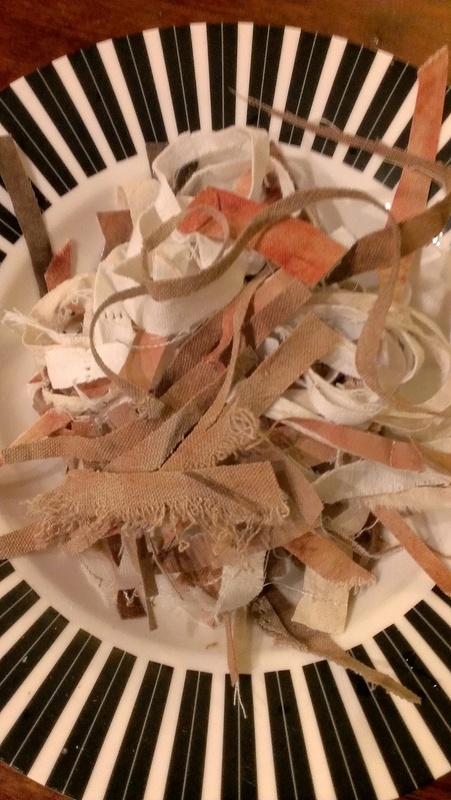 Mother used to make a neat bundle of left-over fabric, pinned together, but I can’t remember her doing anything with it. I well remember being under the table and asking if I could have a piece that had fallen to the floor. Mum examined it carefully and agreed I could have it, and I felt very specially blessed. About an hour later she realised it was actually a small pattern piece–part of a facing, I think. It was quite a crisis! My Mum used to do that, too. But she did use decent sized scraps and I was sometimes lucky enough to get small pieces to turn into my own little projects. I eventually inherited all kinds of leftovers from her and made a quilt with 3 cm squares, started as a child and finished as an adult. There were little pieces that reminded me of dresses and a library book bags and all manner of good things! I think I was allowed to make doll’s dresses when I was about 11 with scraps, running them through the machine very speedily, no tacking ….. awful impatient person! 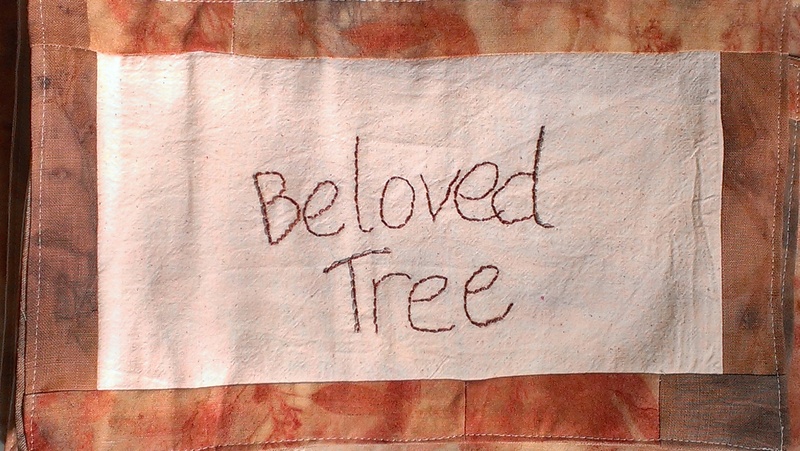 thinking that string made from plant matter and a label made from something similar…and then you have a ‘beloved tree’ tag that will be gradually re-absorbed into the environment. i bless the day that Nalda Searles taught me how to make string.